I've never been happier that candy is vegetarian. Instead of eating bacon or cheeseburgers, I can just fill up on chocolate. I suppose I do have to eat some healthy food, though, so I made codcakes for dinner. They're like crabcakes but made with cod instead, since I'm not a huge fan of shellfish. I included the recipe below, but first I'd like to talk a bit more about the impact of eating vegetarian. There is a lot of scientific evidence that eating vegetarian is far more healthy than eating meat, even in moderation. Animal products have been linked with heart disease and clogged arteries because many are high-cholesterol and contain large amounts of saturated fats. Some scientists have found that eating low-fat vegan foods can reverse blocked arteries and reduce the risk of heart disease. People who eat vegetarian for over five years are 24% less likely to die of ischemic heart disease or coronary heart disease, and vegetarians are more likely to be at a healthy weight and avoid adult-onset diabetes. On a night like Halloween when I'm eating way too much sugar and unhealthy foods, it's nice to know that even just reducing the amount of meat I eat can improve my health. I would have to continue eating vegetarian for a while to fully experience all the health benefits (which probably won't happen given how unsustainable my diet would be long-term), but I'm learning to lessen the amount of meat I have in my diet. It's really not that hard with such tasty recipes like this. Pour water into a skillet to come 1/2" up the sides. Add the lemon juice, salt, and 2 tsp season salt and bring to a simmer. Add the fish and cover; cook for 8 minutes or until flaky and cooked through. Pour out the water and wipe the skillet dry. Return to medium heat and add a bit of oil. Add the onions and garlic and cook until translucent and fragrant. In a large bowl, combine the panko, onion powder, garlic powder, and remaining season salt. Add the eggs and mix until smooth. Add the flaked fish and onion mixture and mix gently to combine. Add enough buttermilk to hold everything together. Heat some more oil in the skillet. Form the mixture into 6-8 4oz patties. Cook the cakes in the skillet until brown, about 5 minutes per side. I'm stuffed. I just ate my body weight in lasagna, and it was wonderful. I apologize for the lack of photographic evidence, but the saucy, cheesy mess of deliciousness wasn't exactly attractive. For my second day as a vegetarian, I actually managed to eat vegetarian. I had bread and olive oil for breakfast, a bagel for lunch, and that pile of lasagna for dinner. Of course I would have liked to add some ground beef or sliced meatballs, but I loved every bite anyway. All I had to do was cook some lasagna noodles and layer them with tomato sauce and cheese; you can add vegetables and non-meat protein as well. Just bake for 15 minutes or so at 350F until bubbly and you have some hot, gooey, meat-free lasagna to last you for a few meals. Well, maybe not, if you eat as much as I did. Another aspect of tonight's dinner that made me even happier was knowing that eating vegetarian, even for only a meal, is a step in the right direction for improving the environment. Today, I'd like to focus on the environmental impact, specifically pollution and climate change, of eating a typical American meat-heavy diet. Methane from cattle, gasses released from manure, fossil fuels used in transportation, refrigeration, and cooking, and all other aspects of the meat industry total to approximately 18% of world emissions, but the number can be anywhere between 5 and 50%. The Vegetarian Society estimates that livestock produce 37% of the methane, 64% of the ammonia, and 65% of the nitrous oxide linked to human activity. The EPA has estimated that industrial animal waste has polluted 35,000 miles of rivers in 22 states and contaminated groundwater in 17 states with various bacteria. That bacteria kills fish, harms humans, and causes algal blooms, which consume large amounts of oxygen and make it difficult for organisms to live there. In summary, the huge numbers of animals needed to satisfy demand wreaks havoc on the environment. The amount of energy required to produce animal protein is far more than the amount of energy to produce alternative proteins. In addition, while some manure is good for crops, the 350 million tons of it produced every year emit greenhouse gasses, spread disease, and contaminate water. I know that I probably won't be able to eat an entirely vegetarian diet, but these statistics certainly make me want to reduce the amount of meat I eat, if nothing else. Remember how last week I promised you another cupcake recipe? Well, here it is, and it's even more perfect for fall (and specifically Halloween) than the last. Instead of chocolate cupcakes, I'm using gingerbread cupcakes. They're basically spice cupcakes with some molasses and caramely brown sugar; in other words, these cupcakes are gingerbread in cake form. Even though gingerbread is kind of a cake already. Whatever. These cupcakes are perfect. It's a pretty basic recipe for a pretty delicious cupcake. Just combine your dry ingredients, beat the butter and sugar together, add some eggs and molasses, and alternate the dry ingredients with some buttermilk. I'll admit buttermilk isn't what you would typically associate with gingerbread. It works, though, and it makes the cupcakes much more tender and fluffy. The cupcakes pair perfectly with a maple glaze, but I frosted them like mummies for Halloween. Don't know which way to serve them? Luckily for you, I included both recipes, so you can serve half one way and half the other. Or you can just drink all the glaze and frost the cupcakes like mummies. Nobody will know, so don't feel too guilty. If you do choose to stick to the Halloween theme (at least for this week; there's plenty of time for maple-y goodness in November... or all year round), the mummies are really easy to make. I chose a basket-weaving tip (my art teacher did commend my apparently wonderful basket-weaving skills in Sculpture back in freshmen year) but used the flat side instead of the ridged side. That's just me, though; you can use a petal tip, a flat tip if you can find one, or the ridged side of the basket-weaving tip if you want stylish mummies. I'm not sure if stylish mummies exist, but they will now. 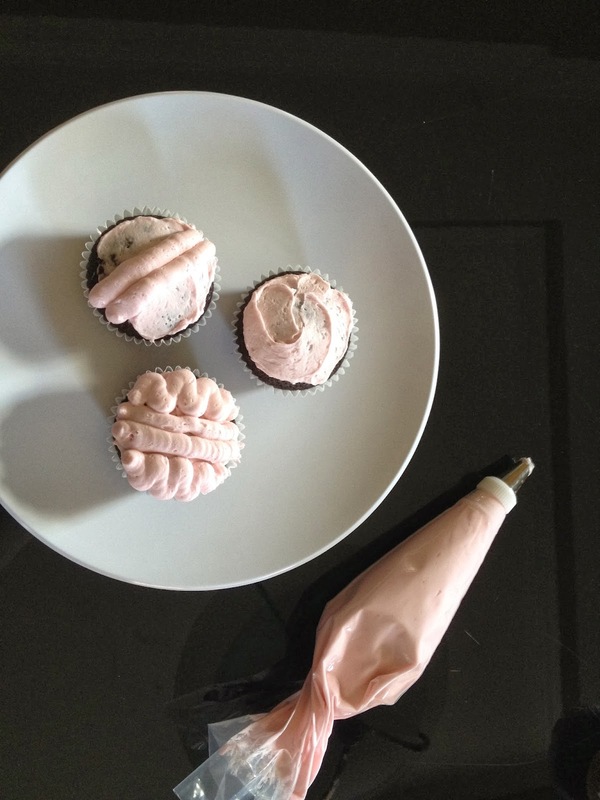 Anyway, once you pick your tip, fill a piping bag or ziploc bag with the buttercream, screw on the tip, and pipe a bunch of strips over the cupcake. Add two mini M&Ms for eyes and you have your mummy. It's that easy. Heat oven to 325F and line a cupcake tin with paper cups. Sift the flour, salt, baking powder, baking soda, ginger, nutmeg, and cinnamon together. Beat the butter and brown sugar together, then add the molasses and beat until light and fluffy. Add the eggs one at a time. 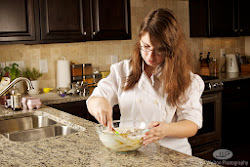 Gradually add the flour mixture in three additions, alternating with the buttermilk in two additions; stir until smooth. Fill the cupcake tins and bake for 20-25 minutes or until cooked through. Cool. For the maple glaze, sift 1 cup of powdered sugar. Whisk in 1/3 cup maple syrup, adding more powdered sugar or maple syrup as necessary until pourable. For the buttercream, beat a stick of softened butter in a stand mixer until fluffy. Gradually sift in 1 1/2-2 cups powdered sugar, then add a pinch of salt, 1 tsp vanilla, and 1T milk. Add more milk or powdered sugar if necessary. To frost the mummies, fill a piping bag or ziploc bag with the buttercream. Use the flat side of a basket-weaving tip to pipe strips of icing across the mummies until covered. Add two mini M&Ms as eyes. It's hard to believe, but Halloween is almost here! Making a recipe with the perfect balance of festive but not too creepy is always a challenge, so this year I decided to go with cupcakes. How scary can cupcakes be? 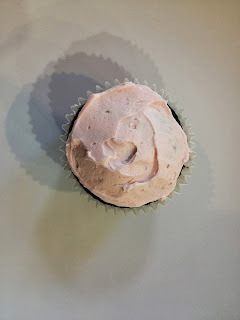 You can use any recipe you want; I chose chocolate, my favorite, as the cupcake and a plain (but still delicious) vanilla buttercream frosting. Feel free to change the flavor of the icing, but I recommend sticking with a buttercream with a splash of extract for flavoring. If you want these to look like brains, you want a colorless base frosting that you can color to the desired shade of pink. Perhaps the one exception to the simplicity rule would be adding raspberry puree or some other pink addition. But let's talk cupcakes. Like I said, I love chocolate cupcakes, and these are twice as good because they are double chocolate cupcakes. That's right; there's cocoa powder AND melted chocolate (and you can even add some chocolate chips at the end to make triple chocolate cupcakes). I also add some coffee to boost the chocolate flavor. The cupcakes won't taste like coffee, but they will have a stronger chocolate flavor with a hint of bitterness to counter the sweetness of the cupcake and the frosting. Using hot coffee further improves the taste of the cocoa powder in particular, but just make sure you cool the mixture down before adding the eggs and other ingredients. On the topic of eggs, don't combine the eggs and the vinegar directly. The eggs will clump up and it is really quite unappetizing. The vinegar is a necessary ingredient for texture and balancing acidity, however, so just stir it in last. The final potentially odd ingredient in the cupcake batter is the flour. It's not your typical all-purpose flour; I like to use bread flour. You might notice that there isn't much of it, but bread flour has a higher gluten content to provide a slightly sturdier cake, reducing the amount needed in the recipe. Heat oven to 350F. Line muffin tins with paper cups. Combine the chocolate and cocoa in a large bowl. Add the hot coffee and whisk until smooth. Chill to cool completely. Combine the flour, sugar, salt, and baking soda. Whisk the oil, eggs, and vanilla into the cooled chocolate mixture. Add the flour mixture and vinegar. Spoon the batter into the cups. Bake until cooked through, 16-18 minutes. Cool. Once the cupcakes have cooled, it's time to decorate. My frosting recipe couldn't be easier, and you can always use a different extract instead of vanilla. 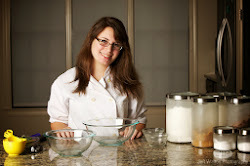 The amount of milk and powdered sugar varies depending on the day (particularly the humidity), but the basic ratio is generally about the same. Beat the butter in a stand mixer fitted with a whisk attachment until fluffy and light. Gradually add the powdered sugar, then beat in the milk and vanilla. Add a few drops of pink or red food coloring until it reaches the desired shade. To frost the cupcakes, I start by spreading a thin layer of icing on the top of each one. It gives the brain something to stick to and covers any spots you might miss later so that you can't see the cupcake underneath. I then use a #12 tip (just a plain round tip; you can always cut a hole in a plastic bag instead) to draw two straight lines down the center of each cupcake to represent the crease in the brain. Finally, I use the #12 tip to draw squiggles on each side of the straight lines. I only did one layer on each side, but you can pile some more on top to give it a more cloud-like or 3D appearance. That's it! You can paint some raspberry puree in some of the crevices for a more gruesome look or play around with different shades of pink and purple icing. If brains aren't your thing and you want a different Halloween cupcake idea, check your inbox soon! Coleslaw is a summer staple, with crisp cabbage and carrots tossed in creamy, tangy dressing. As delicious as coleslaw is, however, something doesn't feel quite right about making it and eating it this time of year. But who says slaw always has to be the typical blend of vegetables and dressing? I found a way to make slaw with fall and winter root vegetables in a balsamic-based dressing, and it couldn't be better. One of the few ingredients I kept in my slaw was carrots. They are perfect for any recipe any time of year, and I love the color and crunch they add to this particular one. I julienned my own, but you can buy them shredded to save time. I also added jicama, which isn't quite as common. It's kind of like an apple-potato hybrid, so it has lots of crunch and a slightly sweet flavor. The last main vegetable is beets. Like the jicama, it's pretty likely that you'll have to julienne it yourself, but all you have to do is peel it and slice it. Be careful not to stain your hands or cutting board; the beets are pretty juicy and the beautiful red-purple color will bleed into your tools. It will also soak into the slaw, making it pinker the longer it sits. The slaw is best after it can sit and marinate for a few hours, but sacrifice some of the taste and serve it immediately if you want to better preserve the trio of colors. The dressing is last, and it's not your typical buttermilk or mayonnaise base. It's more of a vinaigrette, and it has some lemon juice and balsamic vinegar for acidity, honey for sweetness, and cayenne for spice. You can always mince in some spicier peppers or add more cayenne for a spicier dressing, but I like the vegetables to stand out as well. The juice from the beets will add more flavor and a beautiful color as well the longer it sits. It won't sit for too long, though, because you'll want to serve it with everything. This slaw would be the ideal accompaniment to chicken, steak, or any other dish you plan on cooking this season. Combine the lemon juice, vinegar, garlic, honey, paprika, and cayenne. Slowly whisk in the oil, then add the onions. Toss with the carrots, beets, and jicama.